‘Satvik Living’ is the most virtuous and beneficial way of leading a satisfied and disease-free lifestyle. It gives the positivity, wholesomeness, and richness to life, which is extremely important to energize you and live peacefully. Our body is made of Panch Tattvas that when balanced lets you stay healthy or brings sickness if this balance disturbs. Mother earth – Nature, fortunately, provides all such elements in abundance that heal our body and mind. It is up to the wisdom of the human beings to beneficially use them in order to achieve that perfect balance. Naturopathy (practised from the times of our ancestors), inculcates Satvik living and replenishes your body with its utmost requirements. The world is aware of its benefits! It has not just helped in curing ailments but it also detoxifies the body from within, activating all your senses. Nimba – the largest Naturopathy centre of Gujarat, preaches the same teachings to live naturally and people can avail the best therapeutic benefits in a serene and relaxing environment. It is a treat to your body and soul. Recently, Ayurveda Sutra magazine had invited wellness bloggers to Nimba. Their stupendous and rejuvenating experience defines their successful journey. Judy Morris is a wellness fanatic and her visit to Nimba made her connect to nature more closely. She shared her experience of Nimba, here! 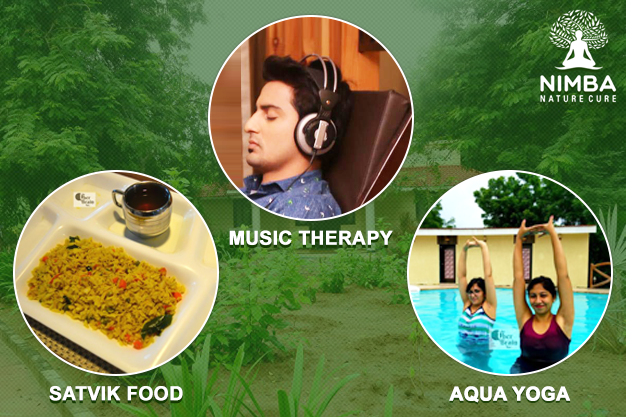 She emphasizes on adopting a nature-friendly lifestyle and taking such retreats more often to de-stress and relaxes in nature’s lap. Delighted with the services, Judy Morris shared her experience at Nimba, on her blog Indiblogger.in. She avers that Nimba has a very organized and disciplined pattern of living that encourages you to lead a very healthy life. In her blog she mentions, the routine she had to follow from getting up early in the morning to performing Satkriyas and Yoga followed by lunch and therapies; every activity was worth spending your time holistically. Surprised by the nutritious food with minimal oil that was provided in the centre, she added that such kind of routine also taught her to eat controllably without gorging on junk unnecessarily. Nimba provides a whole gamut of therapies that include Hydrotherapy, Raga therapy, Aqua Yoga, Shirodhara, Satkriya, Nasyam, Acupressure, Panchkarma and sundry Ayurvedic massages. They heal the body by releasing the deepest tissues and muscles under strain. Judy personally benefitted the most from Jal Neti, Raga therapy and especially – Nasyam that aided in healing her sinusitis problem. According to her, “NIMBA is a great place cause in daily life we do not realize our dependency on unhealthy eating & drinking habits”. “I would wholeheartedly recommend a wellness or a holistic holiday at NIMBA”. Apart from the therapeutic benefits that one experiences, the tranquillity, and comfort that the place offers is it very pacifying and takes you away from the humdrum of daily life. Nimba serves you in every way to regain your vitality and activate your chakras!